The Truth About "The Asian Advantage" and "Model Minority Myth"
There is no "Asian Advantage" -- there are only skewed stats to purport the model minority myth and a divide within the racial justice movement. Even while recent articles by Nicholas Kristof for New York Times and Jennifer Lee for CNN attempt to offer a nuanced argument for Asian-American success stories, their titles alone are problematic: "The Asian Advantage" and "The secret to Asian Americans' Success" immediately generalize and frame Asian Americans as the model minority. Stop, we are not. First off, when people say "Asian American," please remember that this describes a massive conglomerate of 48 countries, with distinct cultural differences and political histories in the United States (from exploited railroad labor, to the brain drain, to war refugees). By nature, anything that describes "Asian America" will essentially be a broad generalization. Perhaps the two most buzz worthy phrases in this conversation are "Asians are the fastest growing racial group in the country" and taken from Kristof's article, "Asian Americans have higher educational attainment than any other group in the United States, including whites." Cue fear of the "Asian Invasion" and resentment towards Asians for being the alleged model minority. In case people have forgotten how to understand statistics, the rates behind "fastest growing" and "higher educational attainment" are proportional to the Asian population in America, not to whites. That being said, Asian Americans make up 5.4 percent of the U.S., population, while whites make up 77.4 percent; that means there are 17.2 million Asian Americans and 246.8 million white people in the United States -- so everyone worried about "Asians taking over" can calm down. Why are Asian Americans considered the fastest growing racial group in America right now? It's not because they're reproducing more rapidly than other groups. No. (Especially since Asian men are generally emasculated in mainstream America). As Jennifer Lee suggests, the growth is largely attributed to immigration law "which favors highly educated, highly skilled immigrant applicants from Asian countries," -- to ultimately benefit capitalist interests and enhance America's economy. In 2012, India and China (the two largest Asian ethnic groups in the U.S.) made up 71.6 percent of America's brain drain, which would skew statistics that generalize Asian Americans as economically and academically more successful. Included in the top ten countries of the U.S.'s brain drain are also the Philippines, South Korea, Japan and Taiwan -- which, in addition to family-sponsored visas for unification, partially explains why Asians are the "fastest growing racial group in America." This description essentially means that the 5.8 percent Asian American population is almost at 10 percent -- but still dramatically less than the black population (13.2 percent), Latino population (17.4 percent) and white population (77.4 percent). In addition to the brain drain, the United States offers special visa programs (EB-5) for wealthy individuals outside of the country: if people invest $500,000 or $1 million in American development projects, they receive green cards for themselves and their families. While there are 11.3 million undocumented people living in the U.S. with the threat of deportation and family separation, wealthy individuals can buy their way in. Already, 25 percent of Chinese individuals worth more than $16 million have emigrated, with the United States as their top choice. So when people talk about the "Asian Advantage" like it's a truth, they are inadvertently talking about the "white agenda." Why did I say "white agenda" and not just "capitalist agenda"? Because it's the (white dominated) U.S. government that encourages migration of wealthy & skilled Asians into the country, while simultaneously positioning Asian Americans as a "threat" to others. In addition, white males dominate CEO seats of Fortune500 companies, white males dominate seats in Congress, white males dominate Hollywood director seats, white males dominate University presidential seats and white males dominate U.S. Presidential seats. I don't even need to show you a bar graph to prove these correlations -- just look around. Perhaps people should be talking about the "white advantage." This article is not to discredit the success or talent of Asian Americans, it is to completely dispel the idea of the "Asian Advantage" because it is an ineffective approach to understanding the community's nuances. Just like in every other community, there are people who are ridiculously successful (Oprah, Jay-Z, etc.) and there are people who are still sleeping on the streets. 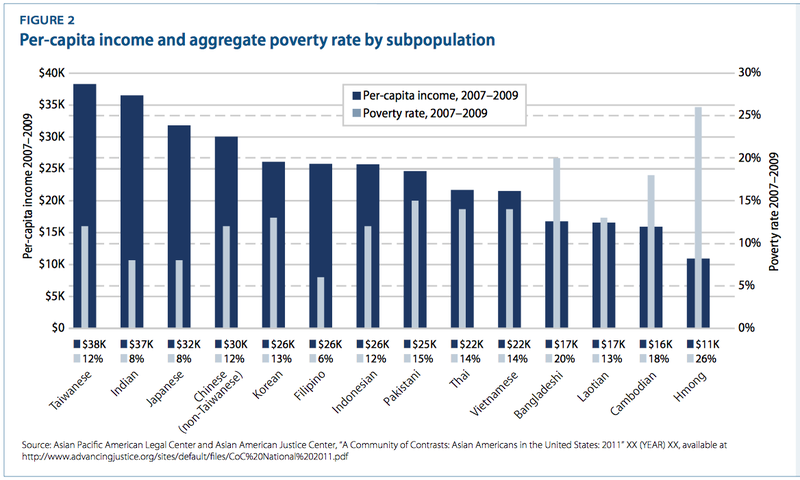 The overall poverty rate in the U.S. is 14.3 percent; relative to their unique populations, the poverty rate for whites is 11.6 percent and Asian Americans is 11.7 percent. 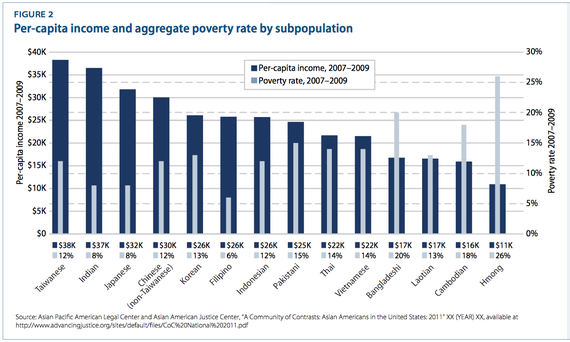 Yet no one is talking about the fact that Asian Americans have a higher poverty rate than whites. Why not? Probably because it doesn't fit their portrayal of Asians as the model minority. Average per capita income for whites is $31k, while for Asian Americans it's $24k. Asians make up 12 percent of the undocumented population (that's 1.3 million undocumented Asians), while whites make up a reported zero percent. But nobody wants to talk about the poverty, unemployment and immigration problems when it comes to the Asian American community, because to do so would accurately align us in the fight for racial justice and hurt the white supremacist agenda (which historically, thrives with divide and conquer tactics). Here's where everyone loves to sensationalize the model minority myth: 18.5 percent of whites have a bachelor's degree (roughly 45.7 million people), while 30 percent of Asians have a bachelor's degree (roughly 5.1 million people). But don't forget everything I just described above about the brain drain; in addition, universities (especially public ones like the University of California, which have 40 percent Asian student population) are welcoming to wealthy international students who pay higher international tuition. Regardless, while 30 percent versus 18.5 percent may draw a scary picture that Asians are taking over university seats, the truth is white Americans still dominate college campuses dramatically in actual numbers. Again, when people talk about the Asian American population and its "disproportionate level" of higher educational attainment, the two largest ethnic groups in this conglomerate are Chinese and Indian, the same two groups most targeted by the U.S. brain drain. A more nuanced approach would be to disaggregate the information, and recognize that only 17 percent of Pacific Islanders, 14 percent of Cambodians, 13 percent of Laotians and 13 percent of Hmong people have a bachelor's degree in the United States. Marginalized communities within the Asian American umbrella become overlooked and underserved because of false notions such as the "Asian Advantage" and "model minority myth." In moving forward, my suggestion is to stop asking the wrong, misleading questions which paint a false picture of the Asian American community. If we want to better understand the diverse and complex Asian American community, we need to start asking better, more informed questions, such as, "How can we provide a solution for the 1.3 million undocumented Asian people in the U.S. to live safely with their families? How can we increase college access and retention rates for Southeast Asians and Pacific Islanders? How can we better represent the the Asian American community through disaggregated data and locating non-identifying Asians whom struggle with language and cultural barriers? How can we better understand and support mental health issues within the Asian American community, also known for having the highest depression and suicide rates in the U.S.?" How can we recognize when the narrative, regardless of whatever claimed attempt to be nuanced or liberal, is actually forwarding a white supremacist agenda over everything else? When white liberals pat Asians on the back and say "Good job at being the model minority," who does that ultimately serve? Asian Americans have long been involved in the fight for racial justice, from demanding reparations for the Japanese Internment camps, to fighting for Ethnic Studies in San Francisco, to leading the Third World Liberation Front, and to marching alongside the Black Panther Party. The fight for racial justice must continue with more Asian Americans speaking their truths, rather than allow others to co-opt our narratives. I celebrate the success, resilience, brilliance and hard work ethic of the Asian American community, while acknowledging that we have a long way to go before racial justice is achieved for ourselves and everyone else. So let's continue doing what we've always done -- working hard and knocking down walls.